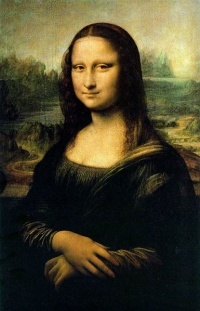 Illustration: Mona Lisa by Leonardo da Vinci. Classical music is the art music produced in, or rooted in, the traditions of Western liturgical and secular music, encompassing a broad period from roughly the 11th century to present times. The central norms of this tradition became codified between 1550 and 1900, which is known as the common practice period. European music is largely distinguished from many other non-European and popular musical forms by its system of staff notation, in use since about the 16th century. Western staff notation is used by composers to prescribe to the performer the pitch, speed, meter, individual rhythms and exact execution of a piece of music. This leaves less room for practices such as improvisation and ad libitum ornamentation, which are frequently heard in non-European art music and popular music. The term "classical music" did not appear until the early 19th century, in an attempt to "canonize" the period from Johann Sebastian Bach to Beethoven as a golden age. The earliest reference to "classical music" recorded by the Oxford English Dictionary is from about 1836. Unless indicated otherwise, the text in this article is either based on Wikipedia article "Classical music" or another language Wikipedia page thereof used under the terms of the GNU Free Documentation License; or on original research by Jahsonic and friends. See Art and Popular Culture's copyright notice. This page was last modified 18:01, 22 January 2014.